Last spring Technet asked me to examine the size of the ‘App Economy’, focusing on the number of jobs being created. The official job statistics from the BLS were no help, given the speed at which the App Economy was evolving. Instead, I developed an innovative methodology for using a ’21st century’ database, The Conference Board Help-Wanted OnLine, to track App Economy jobs. I want to make several points here. Today, the App Economy is clearly a job leader. It managed to create jobs during the worst recession since the Great Depression, suggesting that the App Economy will be a major driver of job growth during the coming expansion. The App Economy cross-cuts industries, including leading internet companies such as Google and Facebook, hardware/software developers such as Apple and Electronic Arts, smaller app developers, and wireless providers such as AT&T. 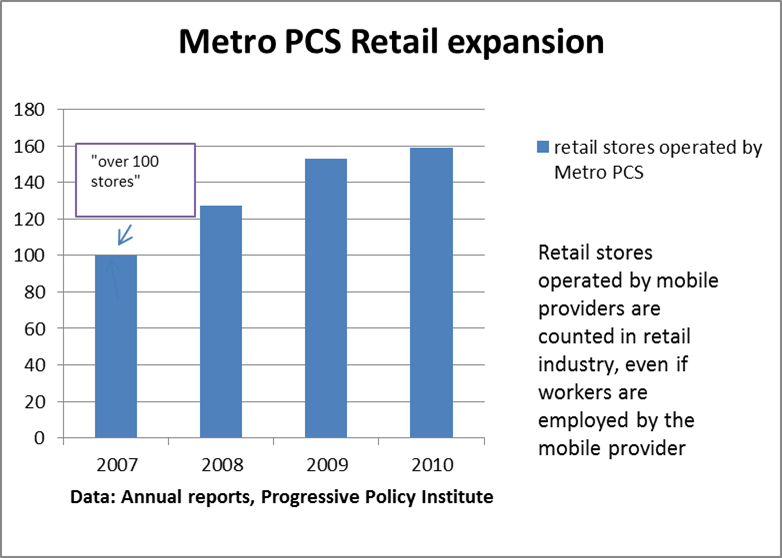 State and local governments that want to participate in the coming expansion should think about encouraging App Economy jobs. The methodology I used enabled me to identify App Economy jobs by state and MSA. Much more could be done along these lines. The federal government needs to adopt policies to encourage App Economy growth. More about this in my next post. I had hoped to write a simple post giving thumbs up or down to yesterday’s FCC ‘net neutrality’ rule-making. Alas, I can’t, yet. Let me explain. I judge their actions by applying the principle of countercyclical regulatory policy: In recessions, the government should refrain from imposing heavy-handed regulations on innovative, growing sectors. The goal is to keep the communications innovation ecosystem growing and healthy. From that perspective, the three basic rules that the FCC approved are fine: Transparency, no blocking of legitimate websites, and no “unreasonable discrimination” by wired broadband. The key here is the transparency provision, which gets little attention. If we look back at the wreckage of the financial boom and bust of the 2000s, the big problem was not financial innovation. Rather, the big mistake made by the financial regulators was not pushing for more information about the decisions being made by Wall Street. That would have enabled regulators to put up a stop sign before things got out of hand. Learning from that bad example, an intelligently-enforced transparency provision for broadband providers—requiring them to release “accurate information regarding the network management practices, performance, and commercial terms of its broadband Internet access services”—would go an awfully long way to deterring abusive practices without interfering with innovation. If the FCC had just stopped with its three rules, we could be heading for the best of all possible worlds …where the communications innovation ecosystem keeps growing, the providers earn enough profits to allow them to keep investing, but where transparency helps encourage them to be good stewards and not to be too greedy. But not content to leave well enough alone, the FCC appears to have added a lot of extra verbiage to the order that muddies the waters, to the point where I can’t even figure out what they are trying to achieve. I say ‘appears’ because all we have so far is excerpts from the text, rather than the full text itself. If regulators can’t make rules that are clear and straightforward, it’s a sign they shouldn’t be doing it. I wait eagerly for the actual text of the order. The current word is that the FCC will vote on net neutrality regulations sometime before Christmas. 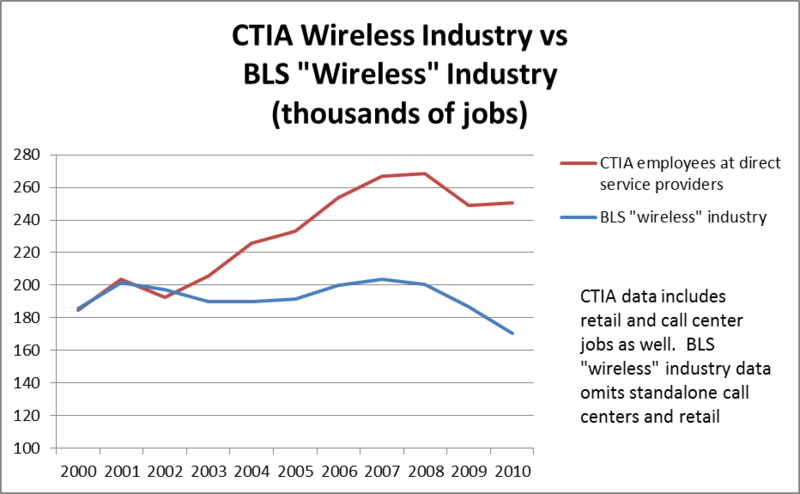 But does the Obama Administration really want to start 2011 with a fight over telecom? As I’ve consistently said, there are theoretical arguments for and against net neutrality. But the timing is just horrible, for two reasons. First, it’s really a dumb move to monkey with the vibrant and growing communications sector when the rest of the economy is so weak. It’s as if you have two cars–one running, one in the repair shop–and you decide it’s a good time to rebuild the transmission of the car that actually works because you hear a few squeaks. Second, the Obama Administration’s cardinal achievement so far is healthcare reform. Flawed as it is, Obamacare represents an absolutely essential step forward. The Administration should be concentrating its effort on defending healthcare reform rather than looking for new industries to regulate. On Wednesday the FCC announced that it was going to put off tightening regulations on broadband providers. Today, the Bureau of Labor Statistics announced that private payrolls rose by 67K in August, a gain mostly due to an increase of 45K in healthcare and education, two sectors that are heavily government supported. 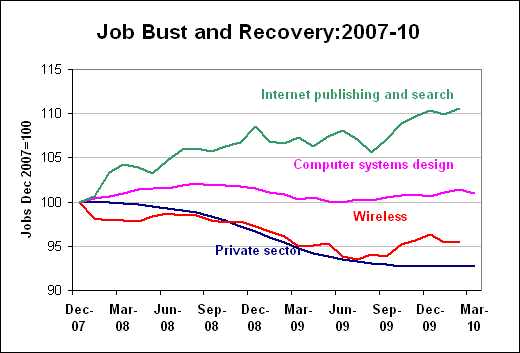 Indeed, over the past year, the rest of the private sector, outside of healthcare and education, has lost jobs. However, there are pockets of strength. One such pocket is in the communications sector, where employment wireless communications, Internet companies (think Google), and custom computer programming services (think apps developers) are up over the past year. This is a sign that this sector may be one of the leaders in the recovery. From that perspective, the FCC made exactly the right decision when it postponed imposing new regulations on communications. At a time when there are so few economic bright spots, it would be a serious mistake to take a regulatory hammer to a growing sector. But there’s a broader principle here. 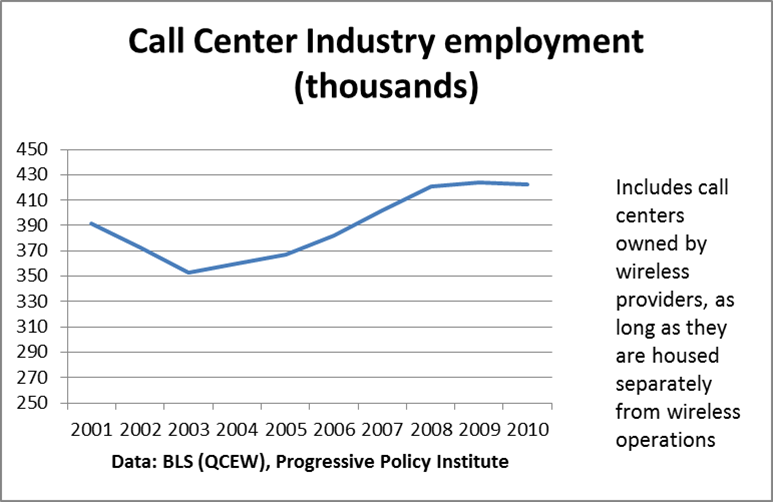 As I have suggested, the Obama Administration needs to think in terms of countercyclical regulatory policy. Regulations are essential for making the market economy work, but timing is essential–not just in communications, but in biosciences, environment, education, and a whole host of different areas. Overly enthusiastic regulation in a deep downturn is not the way for fast and healthy growth. Today’s jobs report shows a bit of good news–123K new private sector jobs. But let’s take a step back from the month-to-month flow of the data and ask a different question. Is the job market giving any sign yet of the shape of the coming recovery? I’m going to apply what I call “Mandel’s Second Law of Booms and Busts” : Industries which recover first in a bust tend to drive the next boom. The intuition is that any industry that can hire in the face of economy-wide malaise clearly has enough strength to boom when the economy does finally start to rebound. 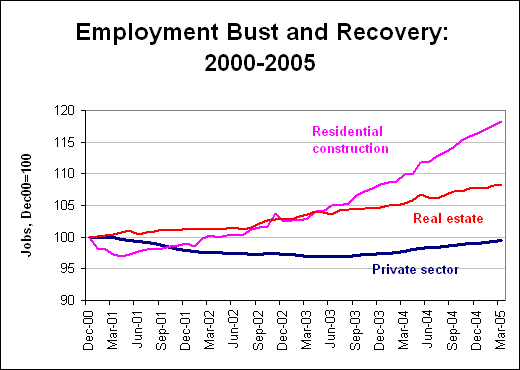 For example, after the 2001 bust, residential construction and real estate businesses started adding workers well before the rest of the economy recovered. This gave a clue (a ‘weak signal’) to the shape of the coming recovering, suggesting that it would be powered by housing. So which industries are jumping ahead of the pack this time? Healthcare, of course, has not been in a slump at all. But other industries have also been able to withstand the downward pressure– Internet publishing, broadcasting and web search portals, computer systems design and programming, and wireless telecom. 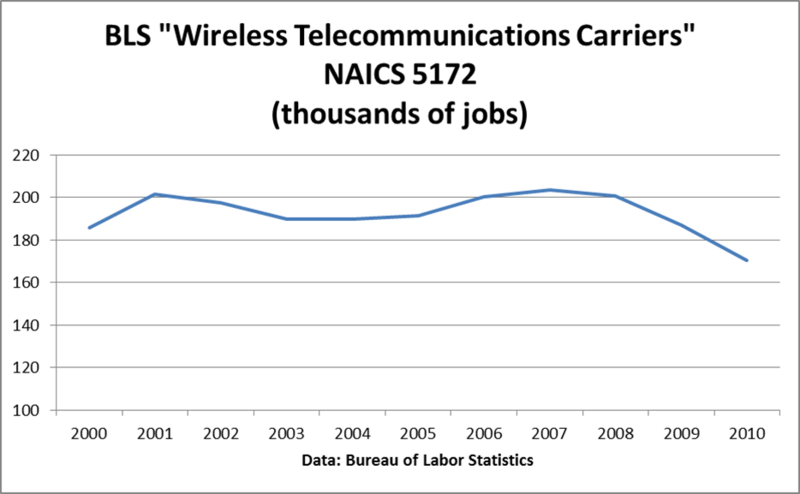 Broadly speaking, the communications sector, broadly defined, seems to be recovering before the rest of the economy. This may be telling us something about the shape of the coming recovery. That suggests we may have a two-track economy for a while. Communications and related areas may have good times, adding jobs and growing. But the rest of economy may bounce along the bottom for a while, especially if local and state governments have to start tightening their belts several notches.